At the end of each school year, Chadron High School contracts with LifeTrack Services, Inc. to conduct a confidential, non-biased senior exit survey. We just received the results for the graduating class of 2014. 59 seniors responded to the survey this year. I've included my notes in comparing these results to the past couple of years. Thank you to all of our seniors for providing this important information which helps provide focus for our efforts for continuous improvement of our school. 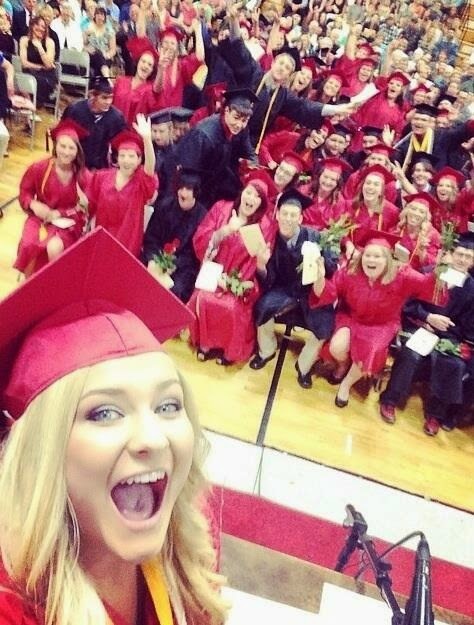 Ashtyn takes a 'selfie' on stage! This was one of my favorite moments during graduation last Saturday ... Salutatorian, Ashtyn Nelson, take a 'selfie' on stage! Congratulations to all our graduates! We're very proud of you! 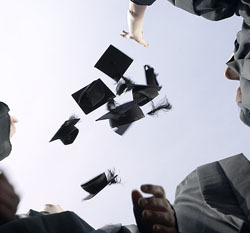 HS Graduation Will Be Streamed Live! Graduation will be streamed live online. Click the icon on the school website at www.chadronschools.org for the link. 1:00pm mst Saturday, May 10th. Last Day of School Changed to May 19th!!! Since we only missed one day of school (due to snow) this year, we will be able to dismiss school one day early! A couple of years ago, the Board agreed for 2 calendar days as 'forgiven days' in the case of weather or unforeseen events. The policy states that time missed beyond the 2 days may or may not be re-scheduled as make-up days subject to administrative discretion. If forgiven days are not needed, the last day of school will be adjusted accordingly. Also, please note that seniors will be checking-out next Wednesday, May 7th from 8-9am. School for all freshman, sophomores, and juniors will begin at 9:00am! Today in Ag Class, Mr. Cogdill demonstrated the techniques of artificial insemination of cattle. Students practiced identification and process using organs of a heifer.